With only 20 miles left to do of this epic journey we allowed ourselves the luxury of a late breakfast. It was gone ten before we rolled out of the Countryman Inn car park and headed for the coast road which would take us via St Just all the way to Land’s End. 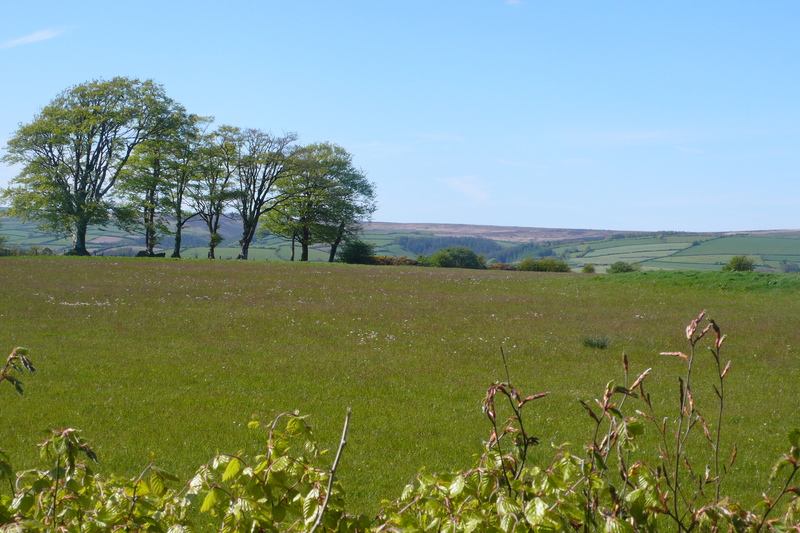 Not to disappoint, the weather was fantastic and the scenery superb – this felt a truly fitting ride to end with. And in keeping with most, if not all previous days, we had some pretty strenuous hill climbing thrown in for good measure. We stopped at St. Just for coffee and toasted tea cakes before setting off on the final down-hill run, through Sennen, to Land’s End. With Land’s End in view Bryan said ‘I’ve spent the last eleven hundred miles with my head up your a – -e (following me), which is infinitely better than having it stuck up my own’ – I think I understand what he meant. There were a few tears of relief before the Champagne cork popped, a brief celebration and then the ‘official’ photos and paper work and that was it – job done! The last word however must go to Bryan, the conceiver of this epic journey, chief route master and navigator, head mechanic, personal trainer, sports psychologist and travelling companion. 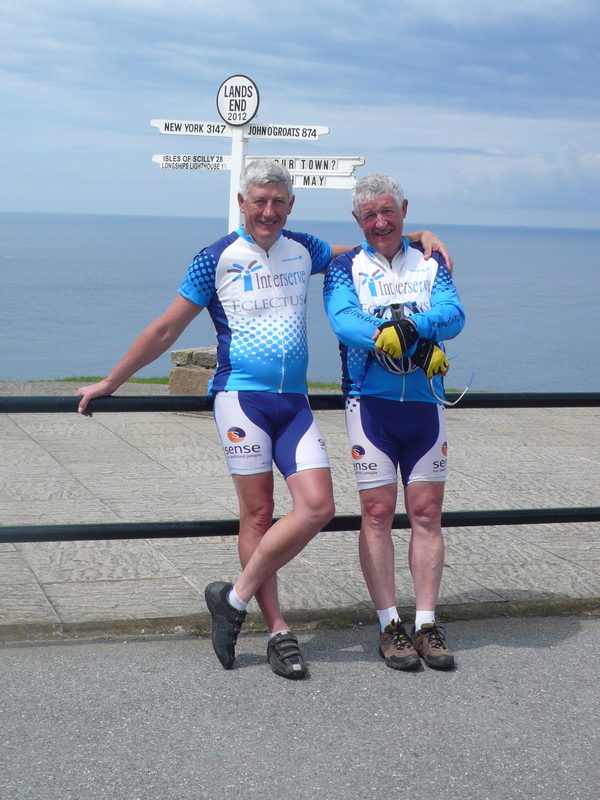 It’s been a genuine pleasure to be part of your odyssey and to be your ‘lead out man’ for the 1150 miles! In case you were all wondering – no great psychological insights, no momentous decisions or life changing moments. 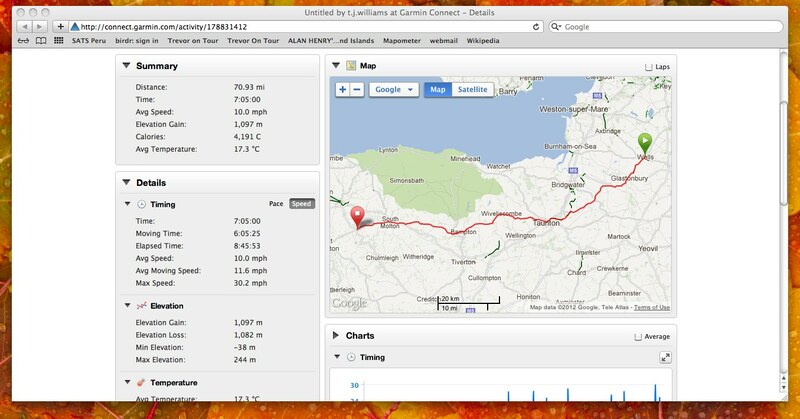 Just three weeks on a bike…with my brother. Nothing more to be said. A full gallery of photos will follow in due course. I’m off to CELEBRATE! As I write this mornings blog the Olympic torch has just left Land’s End on its ten week, 8000 miles, journey around Britain. I couldn’t think of a more fitting day to finish our own End to End journey. I wouldn’t seek to make any closer comparisons between the effort and abilities of the olympic athletes, who will compete this summer, and our humble endeavour but I think I can safely say, when it comes to physical exertion and endurance – we share their pain! 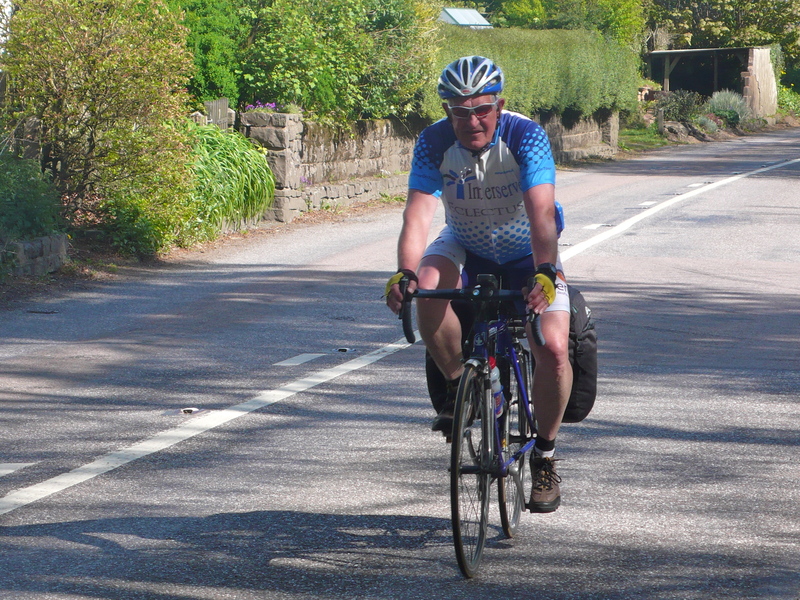 Anyway, back to the task in hand – finishing what we started, three weeks and over eleven hundred miles ago! Our route this morning takes us along the north coast from St Ives, through St Just and Sennen to the very southern tip of England – a distance of about 30k. As birdwatching friends of mine will know, there are also one or two severe climbs on the way! And of course this is all dependent on Bry’s bike holding out, which is far from certain. With no prospect of effecting a repair we are just going to hope that he doesn’t hit any holes in the road and that his rear wheel holds together. He did say last night though that Plan B is to knock some poor child off their bike and steal it – I think he was joking! The route to the finish…. 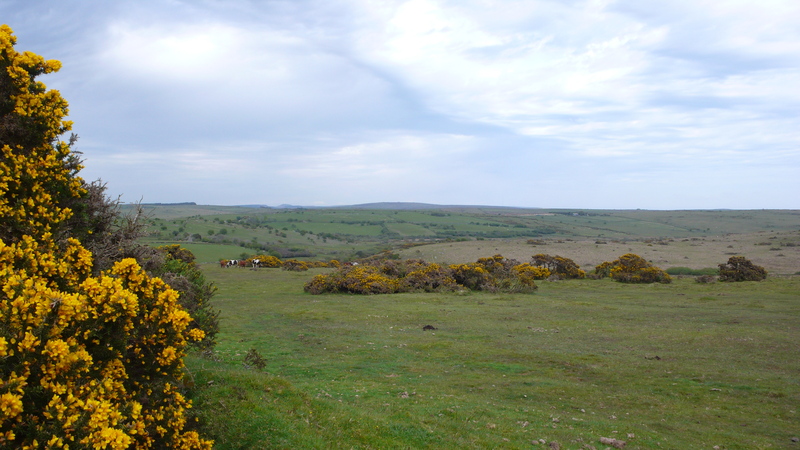 Today was our last full day in the saddle and, following the two previous hard days, was intended to be a gentle ride through the Cornish country lanes from Bodmin to Hayle, a distance of about 50 miles. We’ve been incredibly lucky with the weather and today was no exception; the sun was shining when we left the Westberry Hotel in Bodmin and apart from a slight chill in the air and the occasional dark cloud it remained fine all day. The wind was again kind, coming from the north east. Despite my observations regarding the apparent frequency and severity of the climbs, Bryan remained resolute – today we would follow the planned route and no short cuts. 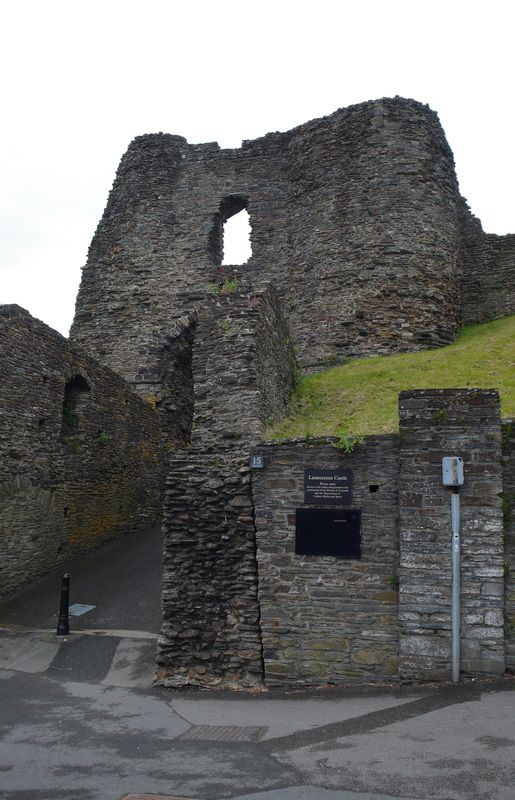 The ride didn’t start well – having found the right road through Bodmin (inevitably it was up hill) we got to the roundabout on the edge of town and carefully selected our route. This time it was down a thundering great hill, allowing us to easily reach the days maximum speed of nearly 33 mph with ease. Unfortunately this turned out to be the wrong road, so back we went! Something about incorrect road numbering I heard Bryan mumble. 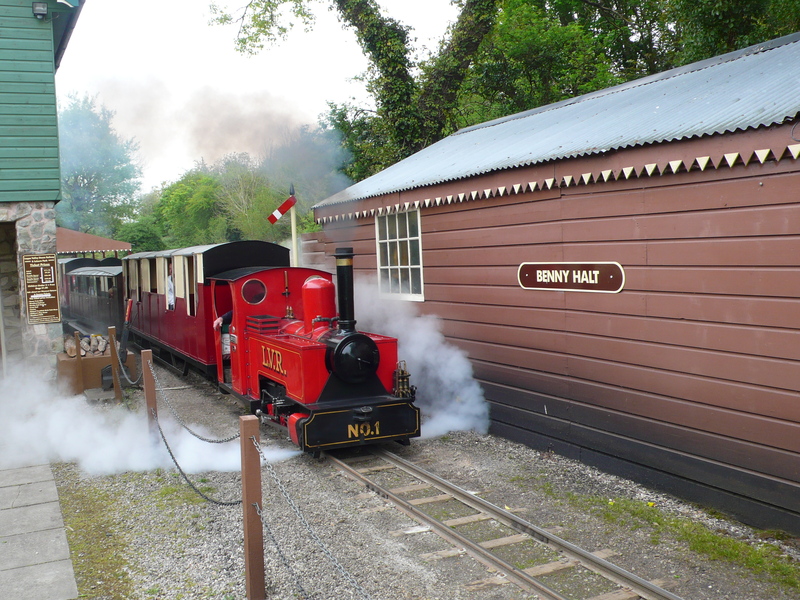 We then threaded our way through the maze of lanes, up hill and down, to avoid the main A30, eventually stopping for coffee at the delightful Lappa Valley Light Railway at the 30k point. 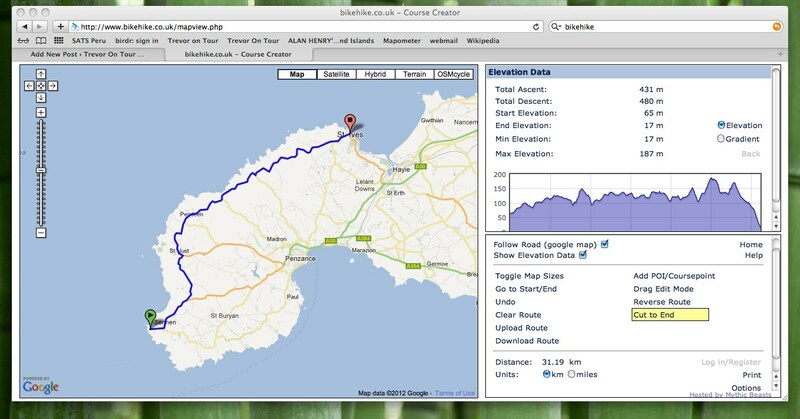 On we pressed to Goonhaven for lunch, omitting the diversion to Perranporth from the itinerary – pastie on a park bench! 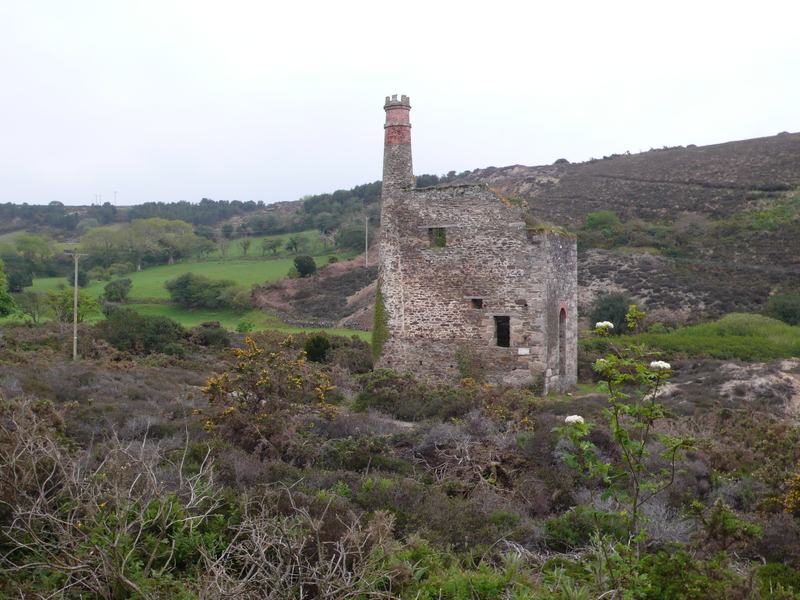 The afternoon’s route became more varied, taking in the ‘industrial’ valley of Porthtowan, with its tin mines and the coastal village of Portreath, where afternoon tea and flapjack was taken at the Tideline Cafe. 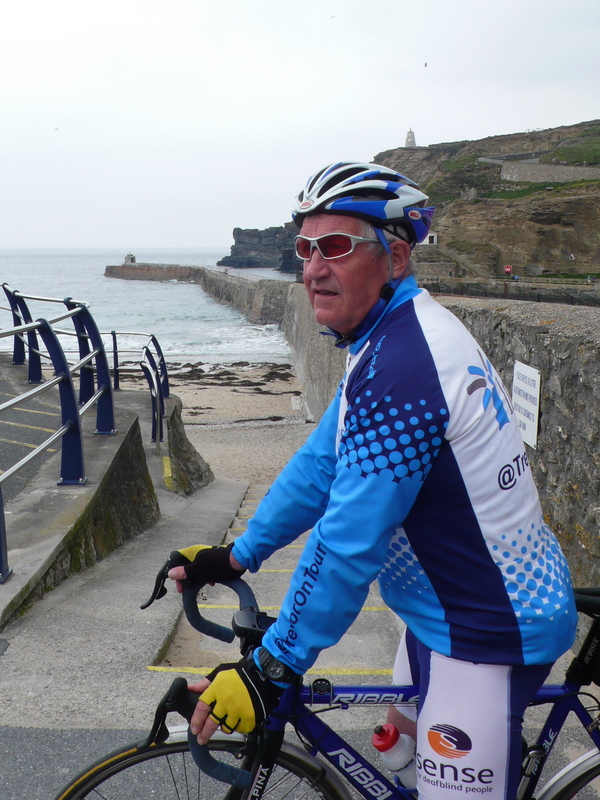 The final big climb of the day, was 1:5 for 300ft, from the harbour at Portreath up on to the cliff tops. 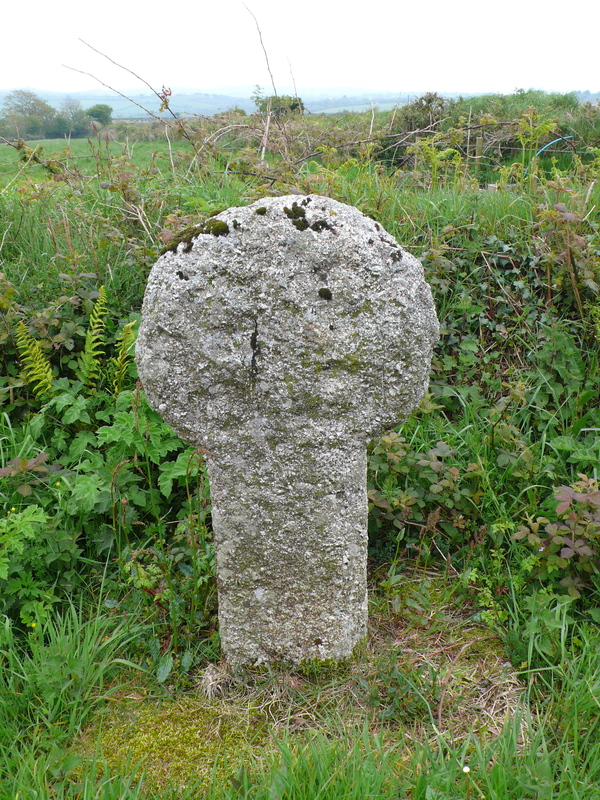 The last 20k to Hayle was one of the nicest sections of the whole trip, with quiet lanes, high Cornish ‘hedges’ and an absolute abundance of wild flowers – bluebells, cowslips, red campion, sea pinks, valerian…just magic! But just when you think you’re cruising to a finish, a safe landing – disaster struck. Bry noticed his cycle computer wasn’t working. 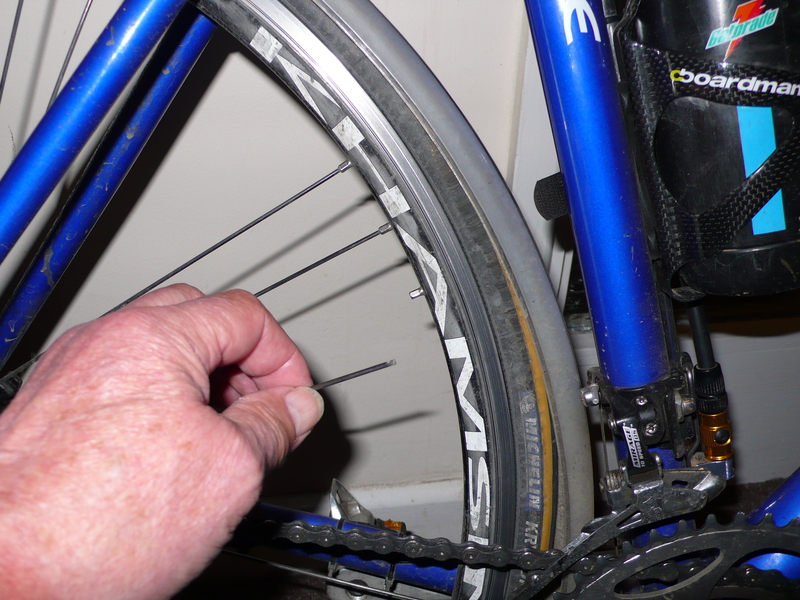 A quick examination of the thing that clips on the spokes and WHAT – a broken spoke on the drive side of his rear wheel. Doesn’t sound much does it but I have it on good authority that it’s one of the worst things that can happen – difficult to fix on the the road but liable, at any point, to cause the wheel to become distorted or even collapse! We finished tonights ride in a high state of anxiety – will Bry’s wheel hold out for the final 30k to our finishing point at Land’s End? The only way we could deal with the stress was to pay a visit to a favourite Hayle watering hole of mine, The Bucket of Blood, for whale and chips, washed down with a few pints of St Austell ales. With no obvious Plan B for the morning will it all come down to luck! Make sure you read tomorrows blog to find out if we make or not! The ‘home run’, with Hayle in our sights what could possibly go wrong? This….a broken spoke on the drive side of Bry’s rear wheel. It’s touch and go as to whether he’ll finish! Off to bed and a sleepless night…. 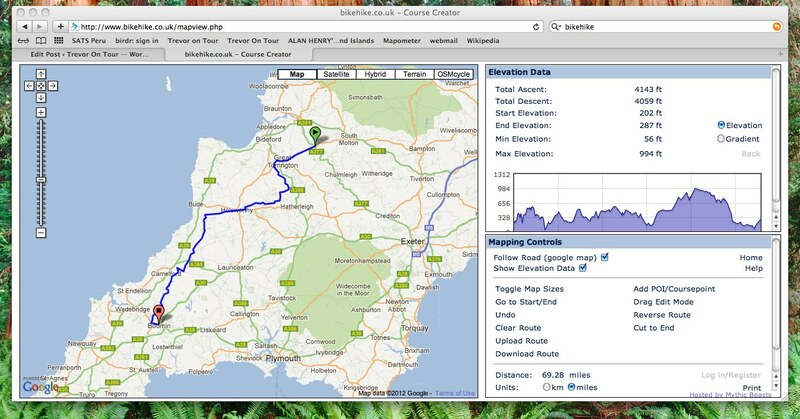 If all goes to plan, and after yesterday’s experience there’s no guarantee, then we should meet up with Jane, aka ‘mission control’, at a B&B somewhere near Hayle, leaving us within spitting distance of Land’s End. We’re still assessing the practicalities of actually getting to the finish in the wake of the Olympic Torch leaving earlier on Saturday morning. We’ll keep you posted. 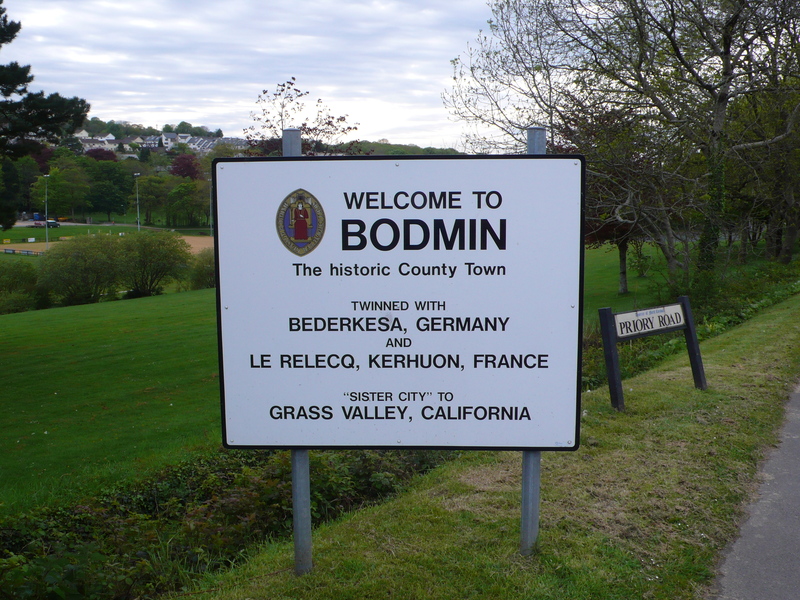 Bl – – dy hell bro we made it to Bodmin! ..and this was even before we started! ..and the sign which, at the beginning of the day, we doubted we would ever see! The grim statistics of todays ride (ordeal)! Sorry for keeping you all waiting. Happy reading. I’m off to bed! We arrived tonight at The Rising Sun,Umberleigh in deepest Devon, ahead of schedule and with a thousand miles under our belts. There is also serviceable WiFi so, fingers crossed, there should be a full blog tonight! 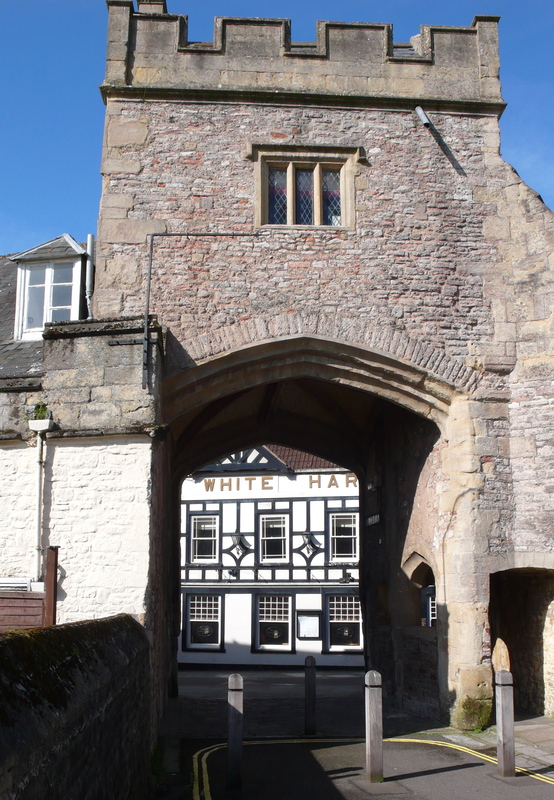 Todays route, which was just over 70 miles, started in Wells, took us across the Somerset levels past Glastonbury, along the towpath of the Bridgewater and Taunton canal and, after our lunch stop in Taunton, our route followed the B3227 across ‘the top’ of Devon, through Brampton and South Molton to our night-time stop. Reveille was at the usual time of 08.00, when Mike our temporary travelling companion, appeared to be in in remarkably fine fettle. 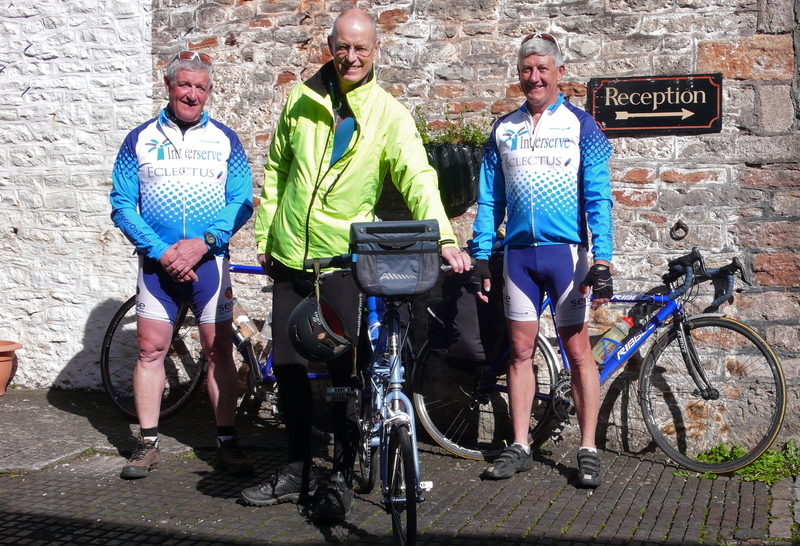 A good breakfast was enjoyed by all before loading the bikes, posing for the ‘team’ photo and ‘pushing off’. 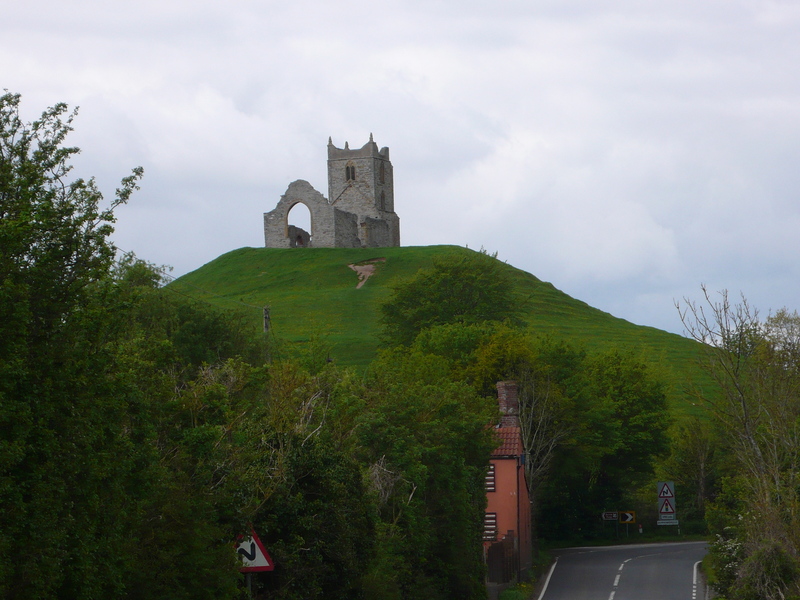 The route to Taunton took us through Glastonbury and Street, on the busy A39, and over the Somerset levels – which had the distinct advantage of being flat for a change. Mike putting a brave face on his obvious disappointment at not being able to put his new-found hill climbing skills to the test! An impromptu stop at Borrow Mump was greatly enhanced when ‘magic Mike’ produced some Blackheath farmers market flapjack out of his saddlebag! A small detour to look for a coffee shop led to a chance encounter with the Bridgewater & Taunton canal. Now you know what a temptation that would have been for Bryan and, sure enough, we decide to go ‘off piste’ and follow the NCN3 to Taunton. 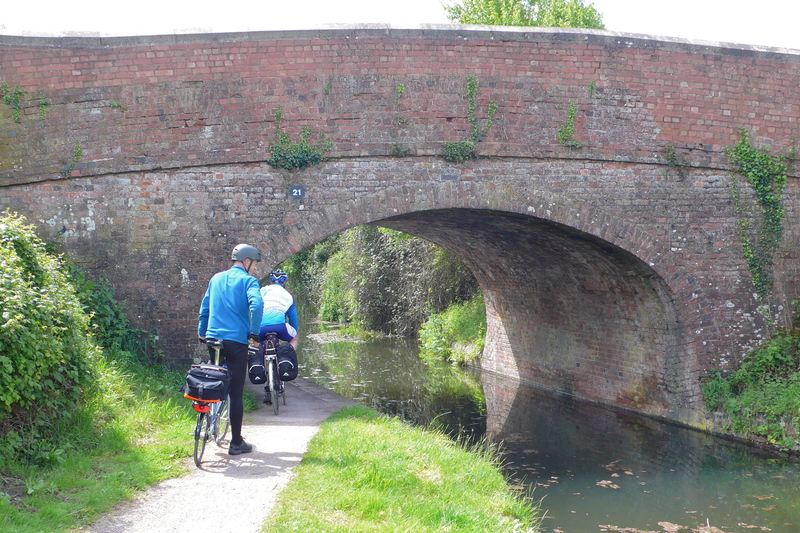 The towpath took us all the way to our lunch stop at Morrisons, where, after refuelling, we said our ‘goodbyes’ to Mike and resumed our route on the B3227. As flat as the morning section had been, so the afternoon was characterised by hills, but not like any we’d encountered thus far. No, these were the ‘Mother….Theresa’ of hills – long-lived, full of suffering and silent anguish! 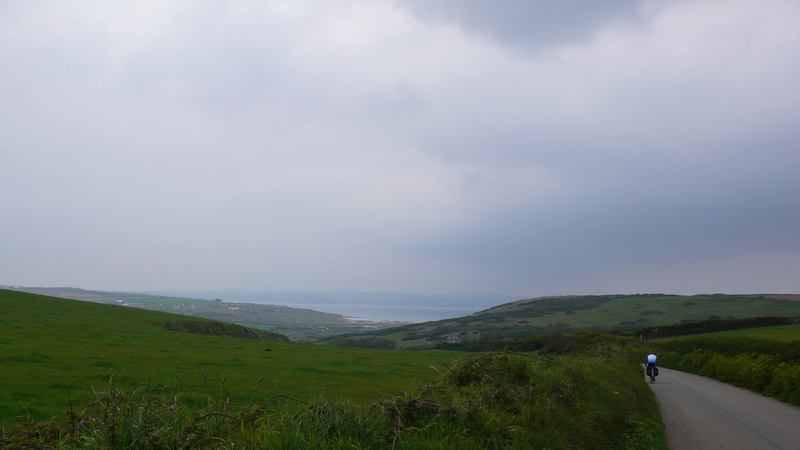 One in particular, between Wivelscombe and Brampton, seemed utterly endless. 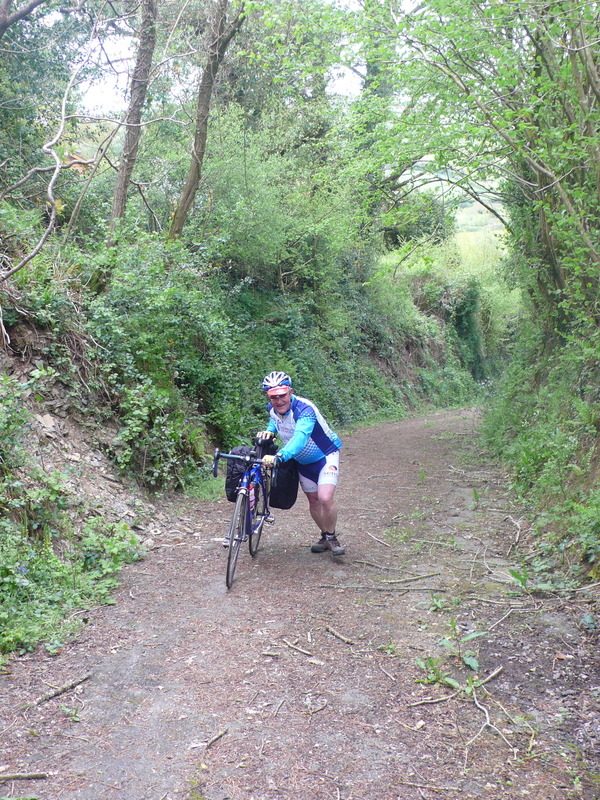 On the subsequent down hill, we crossed the county boundary into Devon, which brought on an inexplicable emotional moment for me – not sure if it was anxiety or anticipation! Anyway, nothing that a good cuppa couldn’t put right and the Toucan Cafe in Brampton was definitely up to the mark with a slab of excellent apricot and almond flapjack thrown in. 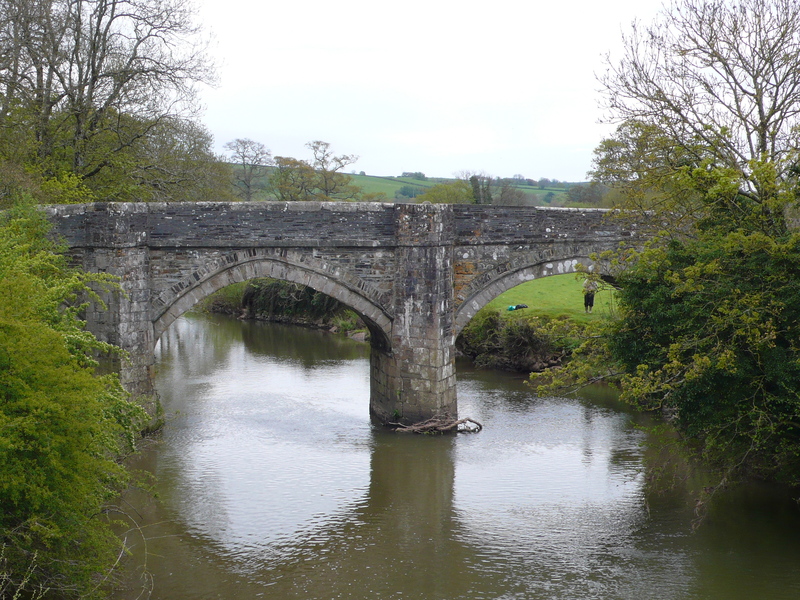 We pressed on to our original finishing point of South Molton (rather reminiscent of the ‘hill towns’ of County Down) and then, with over 100k under our belts already, we carried on. Are they mad?, I hear you cry …yes, undoubtably but mad with method. The additional miles this evening have put us ahead of schedule and give us a fighting chance of finishing tomorrows mammoth stage in more or less one piece. Cunning hey! Stats from todays ride are presented below – look on in awe!